This is a one-of-a-kind experience. 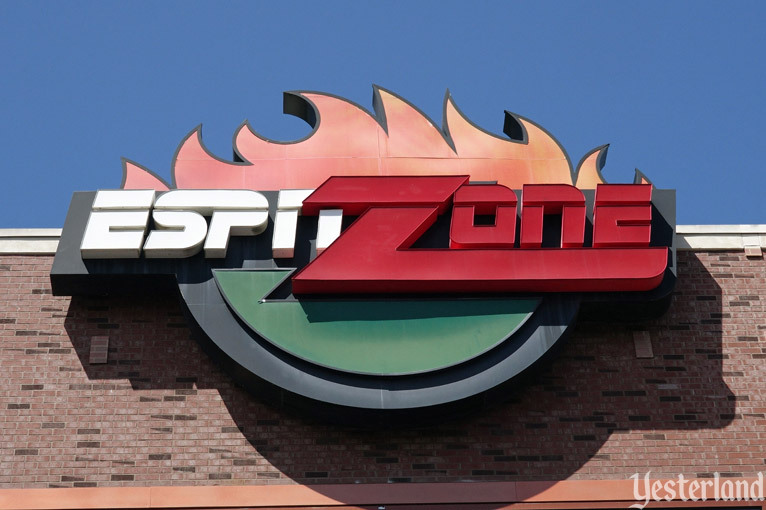 There was a time when this was a nine-of-a- kind experience—there were nine ESPN Zones spread across the United States—but then the chain started shrinking until this was the only ESPN Zone left—and now it’s gone to Yesterland too. 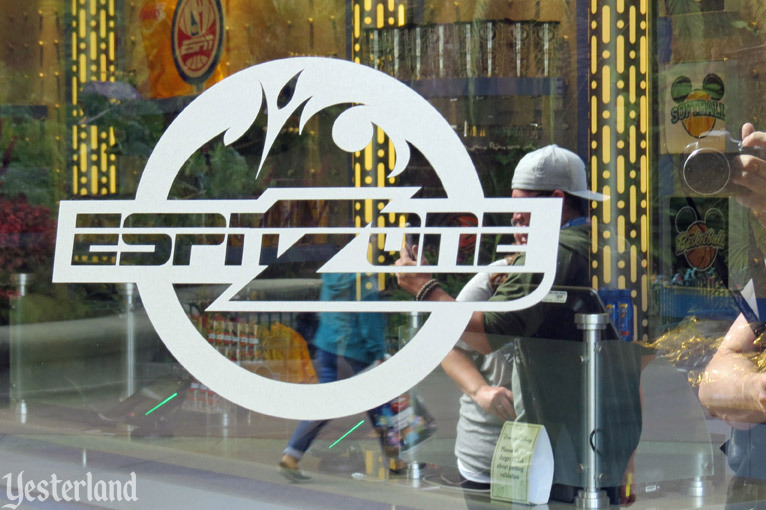 Don’t confuse ESPN Zone with ESPN Club at Disney’s BoardWalk Resort or ESPN Wide World of Sports, both of which are at still at Walt Disney World. They are not the same thing. 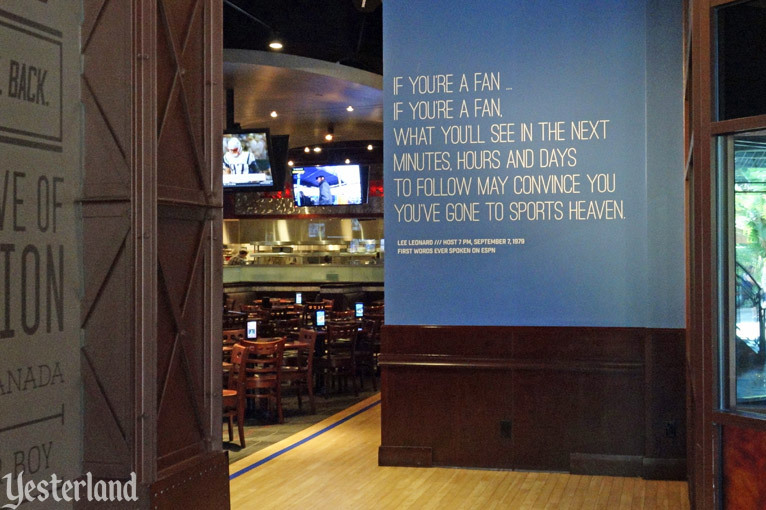 Before you enter ESPN Zone, look up at the bas-relief panels on the south and east exterior walls. They’re animated! The heads slowly move back and forth. You might find it magical—but plenty of people find it strangely creepy. Step inside. There are two floors totalling 35,000 square feet. 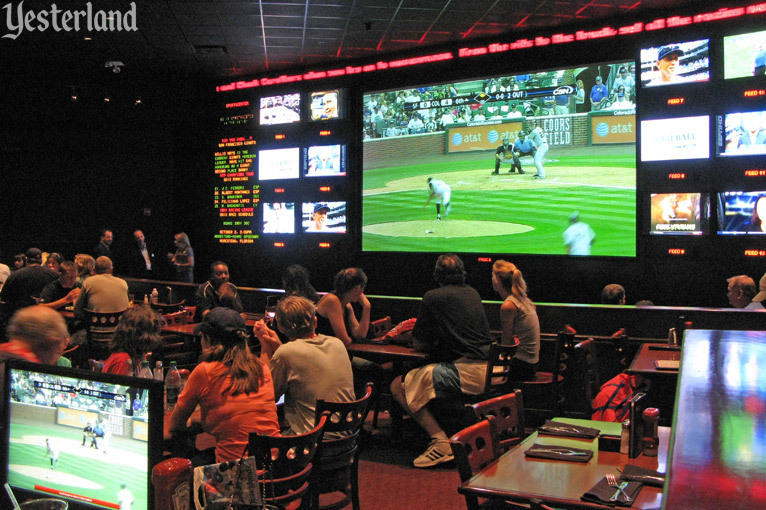 You’ll find interactive entertainment, food for sports fans of all ages, and 175 video monitors showing various sporting events. The upper floor is called the Sports Arena. 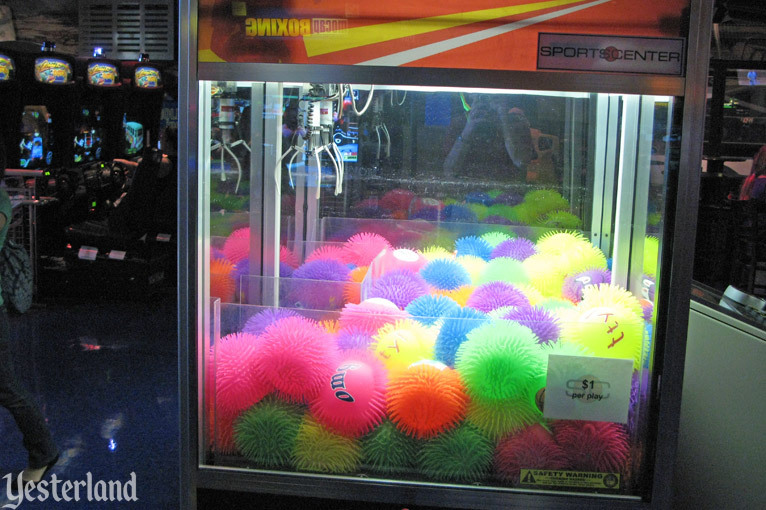 Don’t call it a game arcade. Think of it as a collection of hundreds of interactive sports challenges. 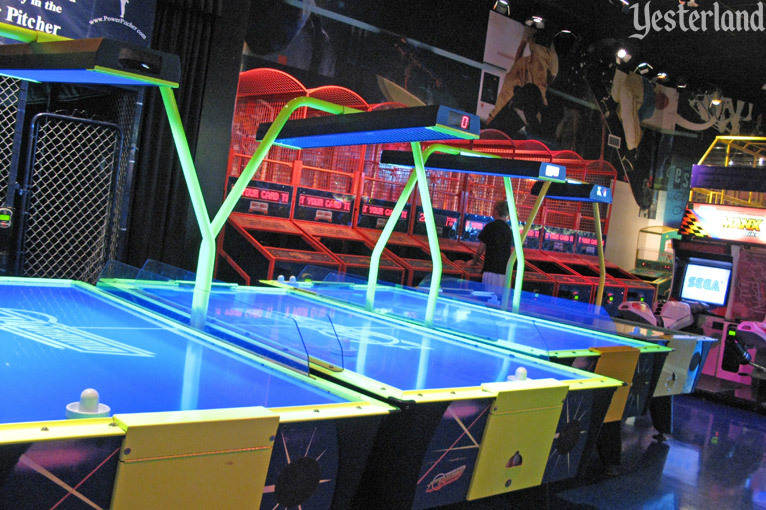 Okay, you’ll find video games that you would find at any large arcade, but the focus is on sports. 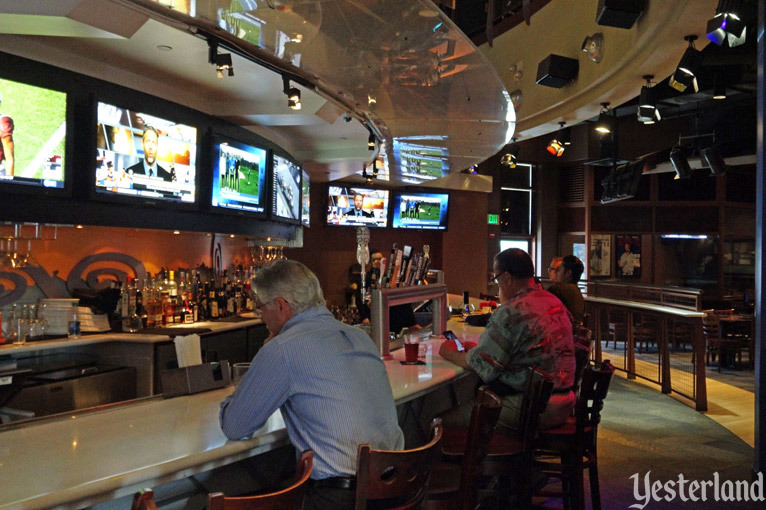 The lower floor has places to eat and drink while watching your favorite sports. 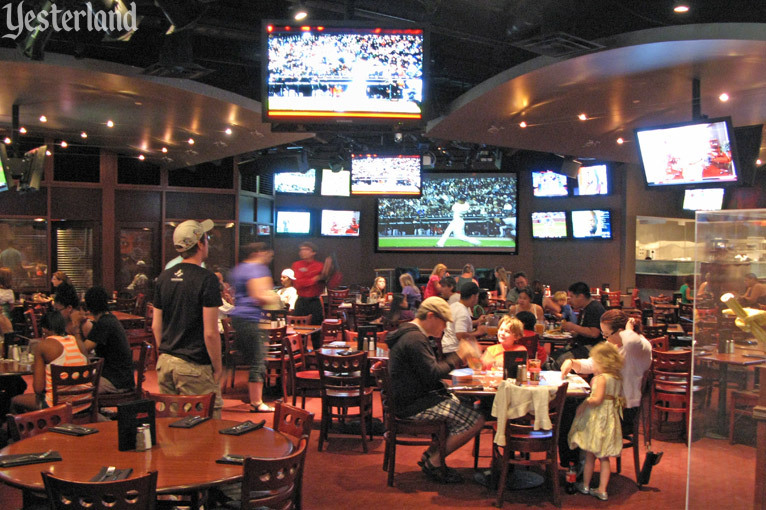 Try the Studio Grill for family dining or the Screening Room for the perfect place to watch ESPN sports coverage. Put in your name for a table, or just look for chairs in the bar. 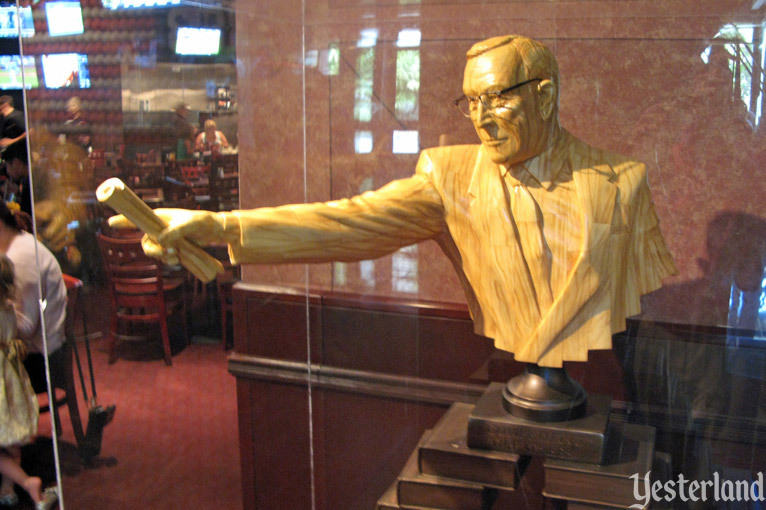 There are plenty of one-of-a-kind art objects and sports artifacts throughout. So look up. Look in corners. Look in cases. Look at the walls. Take it all in. Then again, if you’ve come here, you probably want to look at the monitors, not at the art. When you’ve finished eating—or when the game is over—head upstairs. Let’s see… So far, you’ve watched your favorite team, accompanied by a tasty meal and a cold brew, and you’ve enjoyed interactive sports games. What’s next? 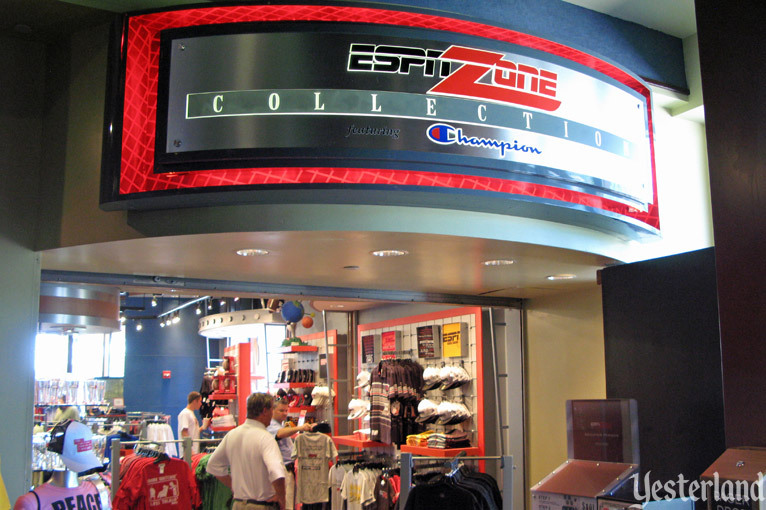 Psst… ESPN Zone Collection and ESPN The Store are the same place. It just depends on what year you arrive. 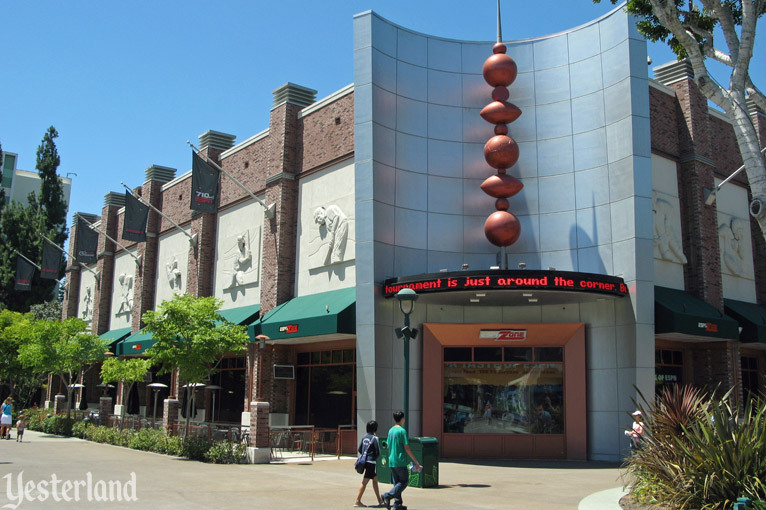 ESPN Zone at the Disneyland Resort opened January 12, 2001, as part of the grand opening of Downtown Disney. 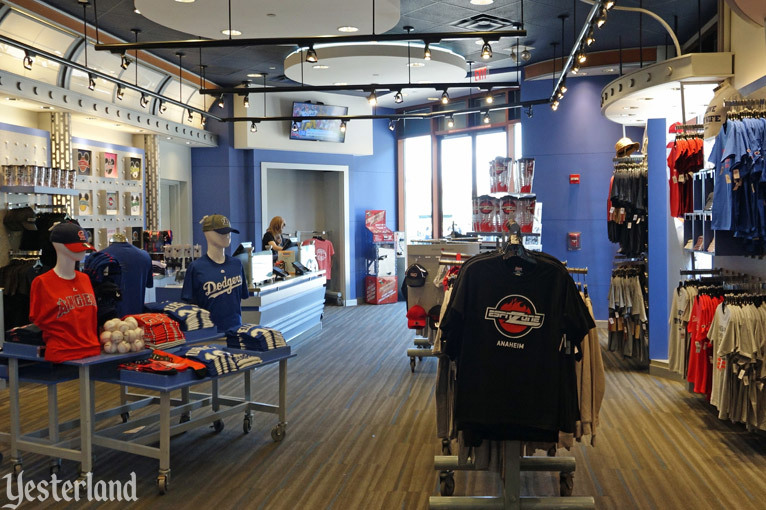 The sports fan mecca was built where the Disneyland Hotel’s Plaza Building once stood. 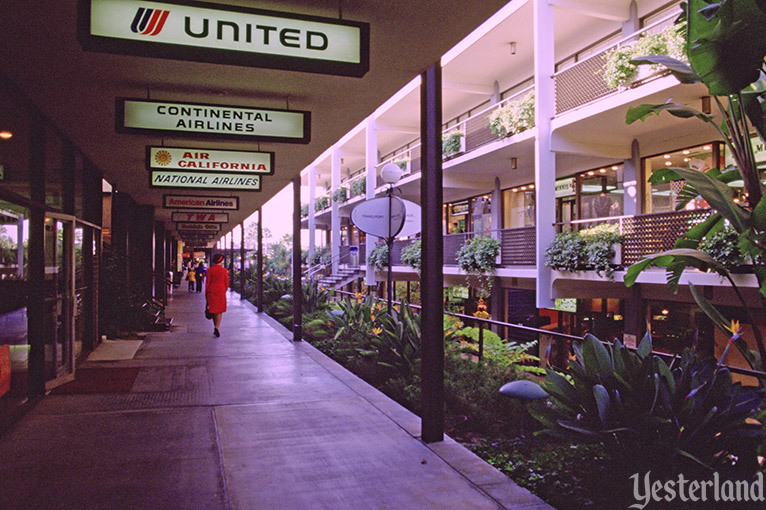 The sleek, modern Plaza Building, which was built in 1966, had two floors of specialty shops and casual dining, topped by a floor of hotel offices. In 1999, to make room for the eastern end of Downtown Disney, the original buildings of the Disneyland Hotel were demolished. It was ESPN Zone number six. 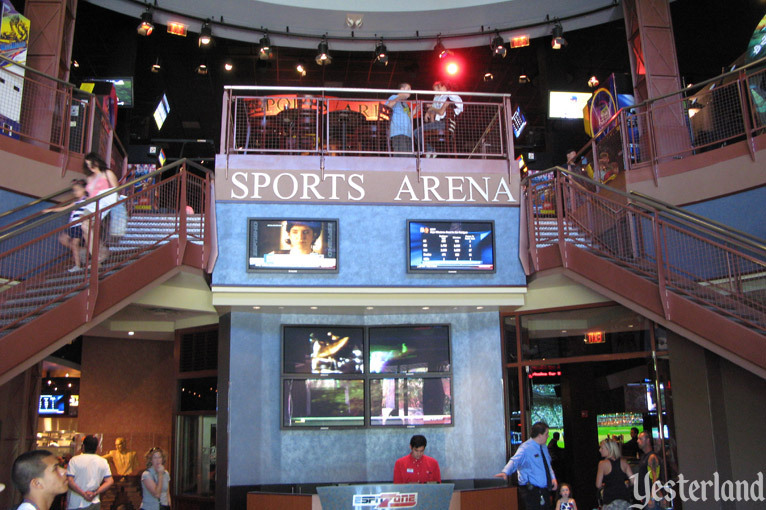 Other ESPN Zones had already opened in Baltimore (1998), Chicago (1999), New York City (1999), Washington, D.C. (1999), and Atlanta (2000). Eventually there would be three more: Denver (2001), Las Vegas (2001), and Los Angeles (2008). But they didn’t last long. 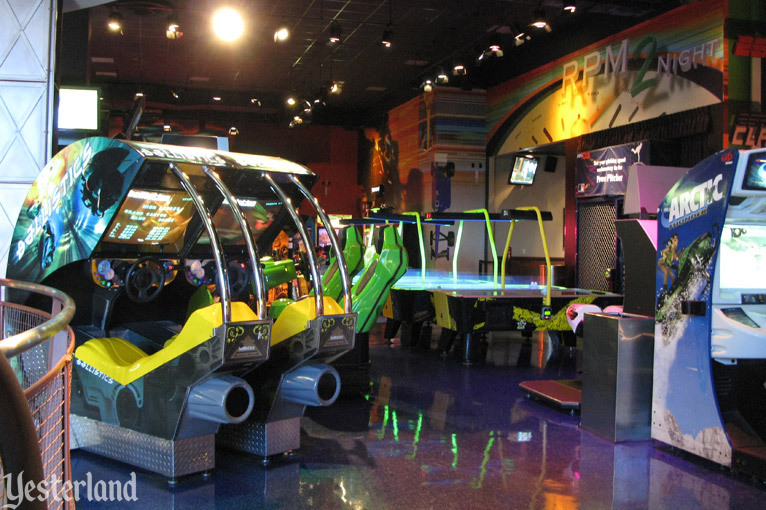 The ESPN Zones in Denver and Atlanta locked their doors in 2009. Five more shut down in 2010. 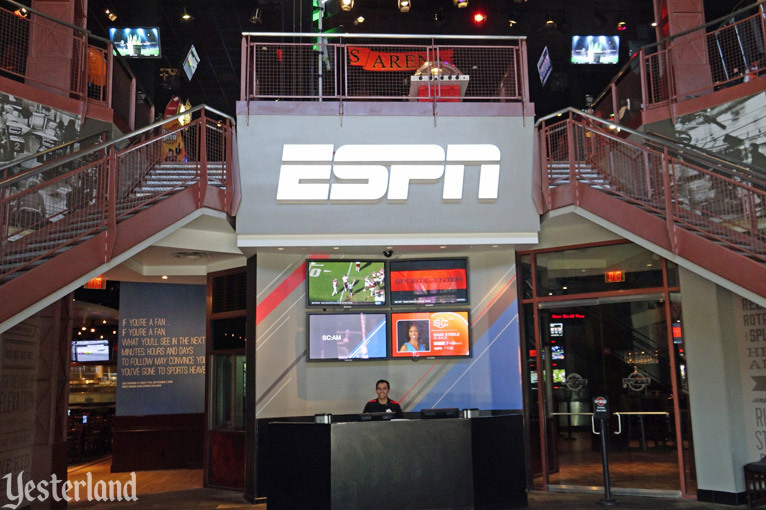 The newest ESPN Zone—owned by L.A. Live developer Anschutz Entertainment Group under a licensing agreement—became the shortest lived when it closed mid-July 2013. 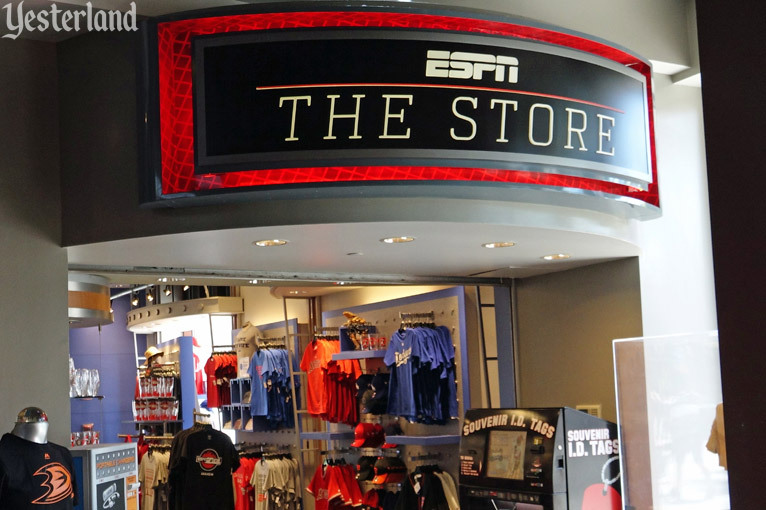 Only one ESPN Zone remained open—the one at Downtown Disney. 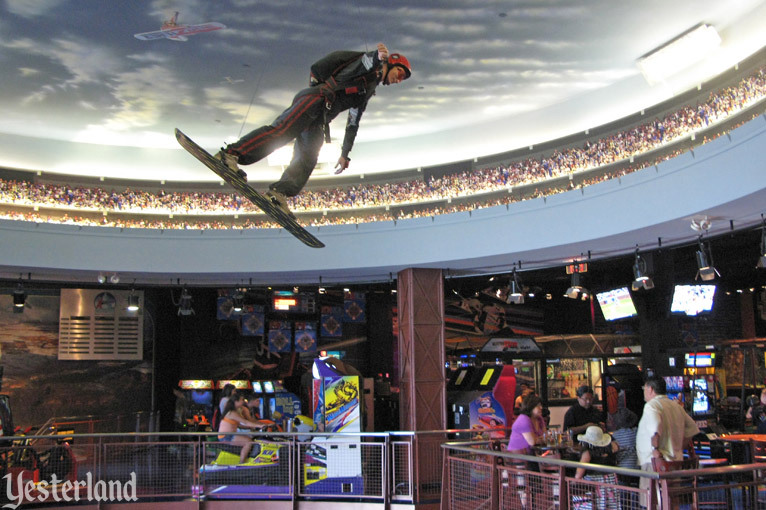 The most memorable event ever at this ESPN Zone—at least from a Yesterland perspective—occurred Super Bowl Sunday, February 3, 2013. But this event had nothing to do with football. 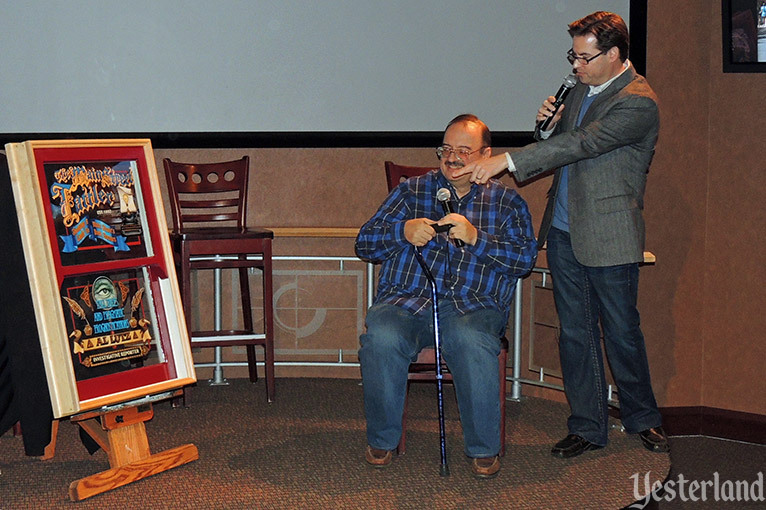 At a MiceChat event long before kickoff time, MiceAge legend Al Lutz was awarded a custom window comparable to the finest windows on Main Street U.S.A. This work of art featured The Main Street Tattler, Al Lutz, Investigative Reporter. It was a well-deserved honor. 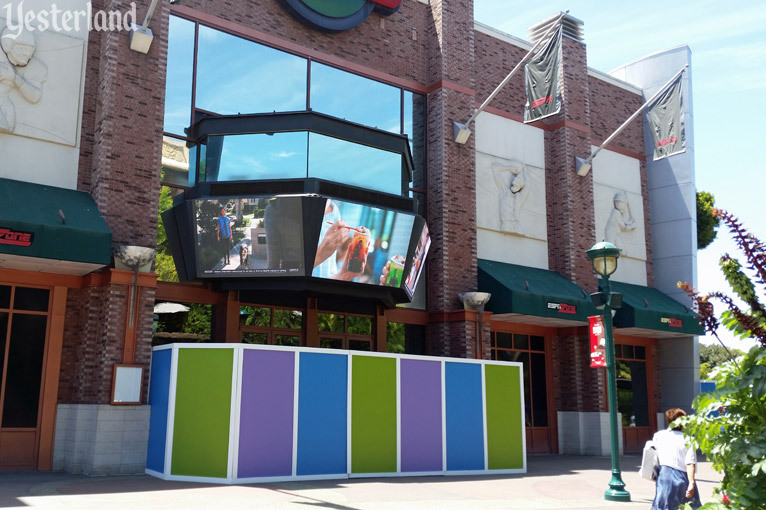 On Saturday, June 2, 2018, the final ESPN Zone had its final day. Nineteen years earlier, part of a hotel had been demolished to make way for it. Now it would be demolished to make way for a hotel. The stunning 700-room hotel will feature a sophisticated design and be a game-changer for Anaheim, creating a dynamic dining, entertainment and hotel experience for resort visitors and local residents. Extensive landscaping and water elements will create a resort oasis, showcasing nature on every level of the hotel. The hotel’s location embraces the iconic Disneyland Monorail with a dedicated platform inside the hotel for direct transport into Disneyland park. Who knows? Maybe the new hotel’s shops and restaurants will even include a sports bar. 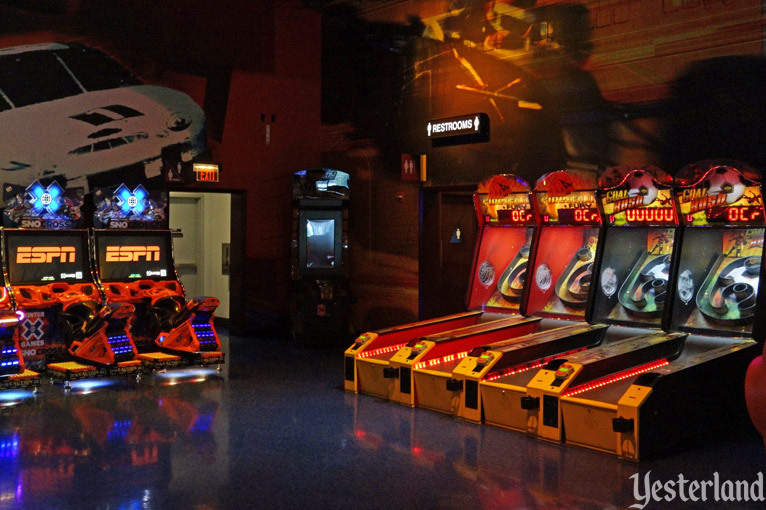 To read more at Yesterland about ESPN Zones and to look inside another location, go to ESPN Zone, Chicago. Click here to post comments at MiceChat about this article.